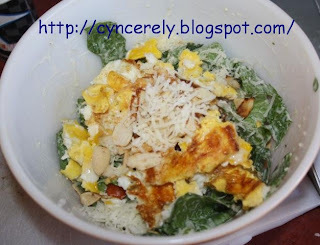 Cyncerely yours: Not your average egg salad! 2 tsps Renee's Ceasar dressing light. I was going to add chicken or beef, but it would, in my opinion, have been too much. Chop Romaine in bite size pieces. Add tomatoes, almonds, cheese, and dressing. Decorate with a pinch of almonds and cheese. The heat of the eggs will melt the cheeses a little, and make the salad that touches the eggs a little bit wilted. But when you get that bite with both hot and cold in it, its oh so good. This made me a little bowl, and I'm full, had my proteins (I'm outta eggs tho.) and I can go back to bed.